This is a dish that has all my favorite ingredients & I would love to eat it any time of the day! 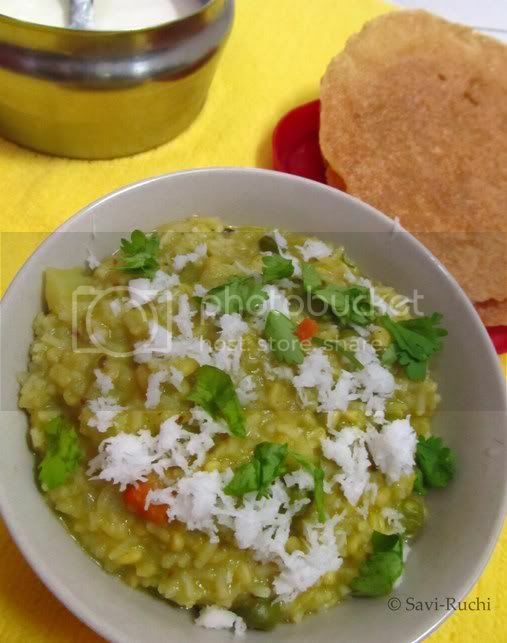 I am never satisfied with the pressure cooker method of preparing khichdi. I always cook khichdi using the stove top method. Though stove top method takes about an hour to cook, the final result is simply WOW! Recipe Source: Adapted from Enjoy Indian Food. Wash the dal thoroughly & soak them in water for 30mins. Whisk the yogurt & keep aside. Meantime, make a fine paste of the ingredients mentioned under the green paste section. Heat a thick bottom saucepan or utensil. Add ghee. When ghee becomes hot, add cumin seeds. When seeds turn brown, add bay leaf. 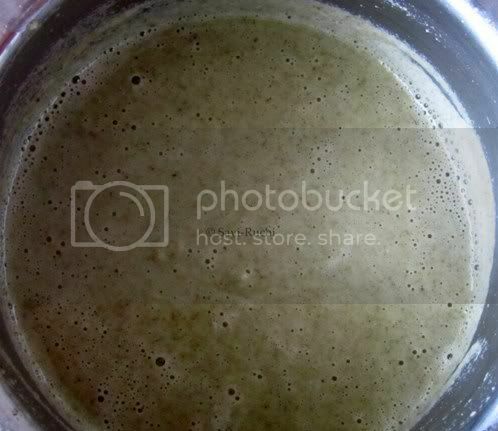 Pour the green paste to the pan & stir well. Add the turmeric, pepper powder, coriander-cumin powder to the green paste & stir. Add the yogurt & mix well. Drain the water from the dal & add it to the yogurt mixture. Throw in the chopped potatoes, carrots, shallots & peas. Add the water & allow the dal to boil & cook on a medium-high heat. Meantime, wash the rice thoroughly & soak them in water for 15mins. Because of the addition of yogurt, the lentil/dal takes a long time to cook. Stir the mixture once a while to ensure dal doesn't stick to the pan. When dal gets 3/4th cooked((It takes around 20-25mins for lentil to get 3/4th cooked), add the soaked rice & continue cooking. When the rice gets cooked (soft yet firm), add the salt. Mix well. 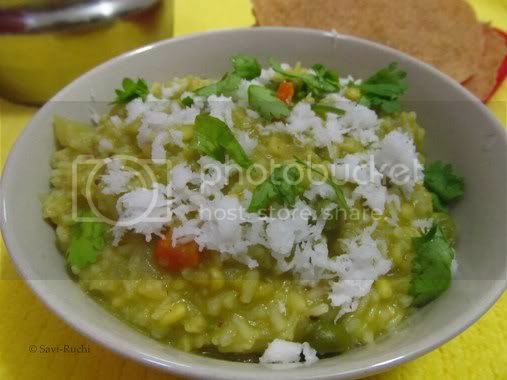 Reduce the heat to medium-low & continue cooking until the khichdi becomes a little mushy (like a porridge). Turn off the heat & garnesh it with coriander leaves & grated coconut (completely optional). Serve it hot with a raita or kadhi or plain yogurt/curd & papad. 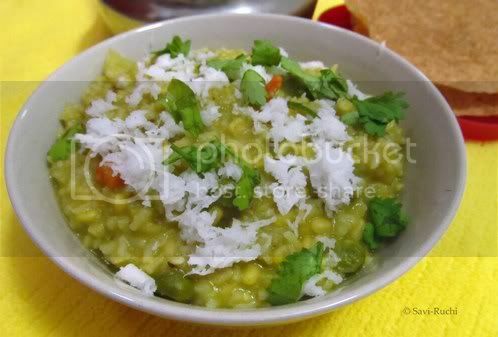 If you feel, water is insufficient for the khichdi, add hot water in between while the rice & the dal mixture is getting cooked. However do not add hot water when the dal & rice is completely cooked. If your family doesn't prefer garlic, you could omit it. 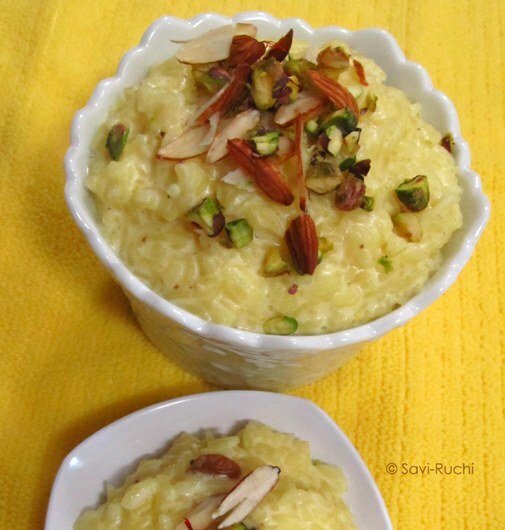 Cooking the khichdi on a stove top takes 2-3 times more time than the pressure cooker method. If you are in a hurry, you could pressure cook it once a while, but I recommend preparing it without the pressure cooker. Do not try to reduce the yogurt as it is the highlight of the dish. Do not use butter milk, use store bought or home made plain & fresh yogurt. Sour yogurt is not recommended. 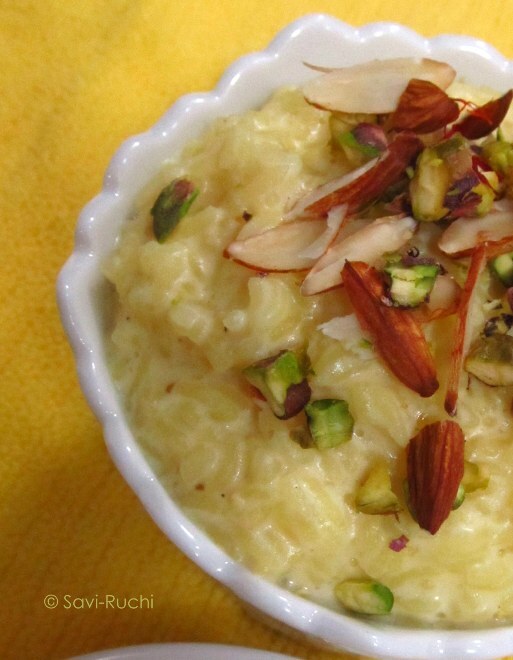 Indian festivals become incomplete without a dessert or a sweet dish. Any household would cook a wide range of sweets without bothering how much taxing it could be. 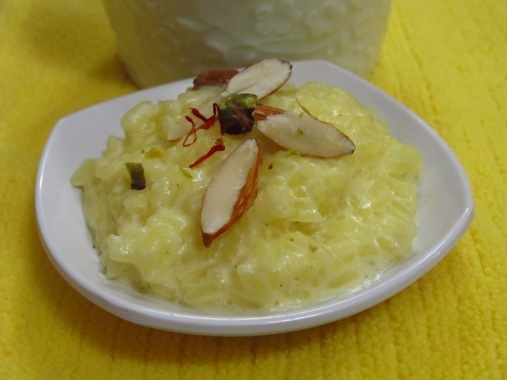 A very simple yet exorbitant kheer is one of them for sure. So, here I present today a time consuming but not so taxing kheer/payasam/pudding recipe that is loved by one & all! Wash the rice thoroughly & soak them in water for 10-15mins. Meantime, heat milk in a thick bottomed vessel. Crush the safrron between your palms & add the saffron to the milk. When milk becomes hot, drain the water from the soaked rice & add the rice & raisins to the milk. Preserve the other nuts for later use. Stir well. Cook the rice in milk on a medium heat. Keep stirring once a while to ensure that rice doesn't stick to the bottom of the vessel. When rice is cooked (takes around 30-35mins), add the sugar, cardamom powder & reduce the heat. Cook on a low heat for another 5-7mins. Turn off the heat, garnish with the chopped nuts. Serve them hot, warm or cold. The payasam becomes a bit thick after it is cooled down. If you prefer it more on the kheer types, add few tablespoons of hot milk to your serving & heat for couple of minutes in the stove or microwave & then enjoy! I'm sending this recipe to the event "Tried and tested" hosted by me & to the event creator Lakshmi. Update: I'm also sending this to Priya's "Celebrate Sweets-Sweets with rice" event & to the creator Nivedita. Its been very very busy time for me, from the past couple of weeks. No time to sit at one place. I am moving all around the place to finish up all the work. At the same time, I am clearing my pantry too. Now that I am super excited in hosting my first event, that I am visiting Prathibha's space everyday to try something. Pesarattu is one such recipe I tried from the blog. She has blogged about upma pesarattu. Since I was making them for the first time, I wasn't sure if my family would take upma & pesarattu together. Hence, I skipped making upma. Will include it next time. I followed the recipe blindly & it was a super hit at my home. Original recipe could be found here. Oil : 1/2 to1 tsp for each pesarattu. Wash the green gram & rice. 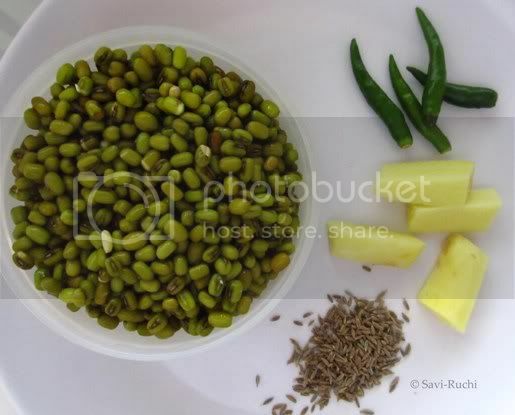 Soak the green gram & rice together for 4-6 hours or over night. Drain the water from the gram & rice. Add the ginger, green chillies, cumin seeds & make a fine paste of the green gram & rice using a Indian mixie/blender or wet grinder. Scoop out the paste & adjust the consistency of the batter. The batter should be like a thick milkshake (just like the normal dosa batter). Heat a griddle/tava. 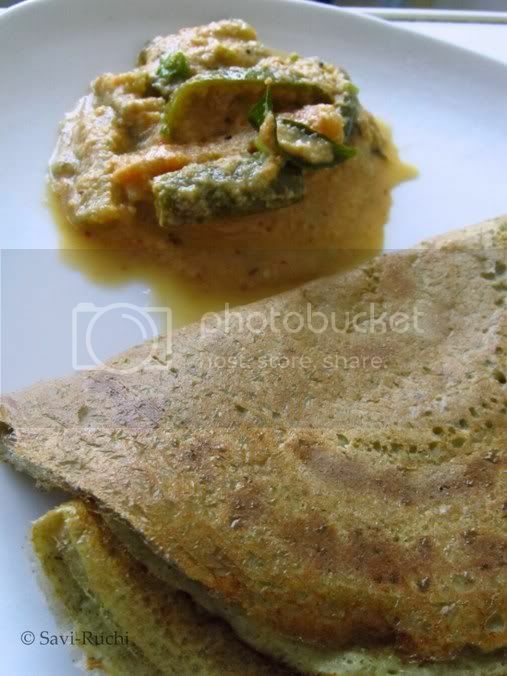 When griddle is hot, pour a ladle full of batter to the center of the tava & spread it like normal dosa. I make the pesarattu very thin. Pour around 1/2 to 1 tsp of oil over the pesarattu & cover the pesarattu with a lid. Let it cook on a medium-high heat for a minute. Remove the lid & increase the heat to high & cook for another 30-45secs. 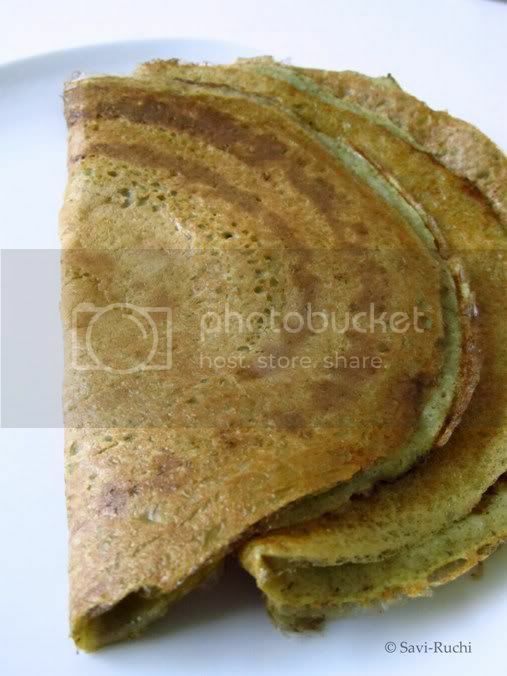 Remove the pesarattu from the griddle. No need to flip the pesarattu & cook it on another side. Reduce the flame & pour few drops of water to decrease the tempeature of the griddle. If the griddle is very hot, the batter sticks to the griddle. Repeat the procedure with the remaining batter. Serve it hot with a chutney/dip of your choice. Pesarattu is cooked on one side only. In case you have soaked the green gram for some other purpose & want to use it for making pesarattu, dont worry that you have not soaked rice. Just grind the green gram & add a fistful of rice flour. Proceed as usual. Prathibha has clearly explained about how to roast the pesarattu. Have a look at it. Announcing my first event - "Tried & Tested" event! I have chosen Prathibha's " the chef and her kitchen" blog as the blog of the month.I have bookmarked a lot of recipes from her blog & want to try them. I am sure most of you must have done it too! She has a well maintained blog with many fans following her. Her blog soothes your eyes with pictures of good food. I love her dosa varieties & Andhra recipes. I am sure you will enjoy cooking the delicacies from her blog. Then what are you waiting for. Visit her blog, cook, click & send in your entries! 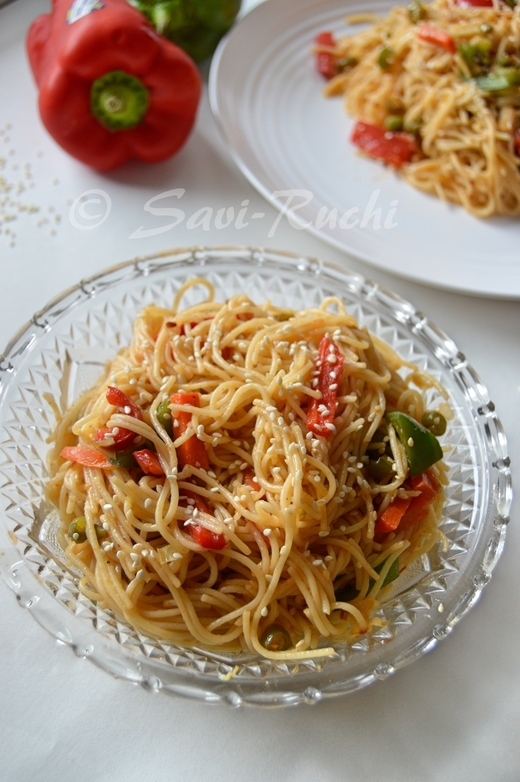 Cook any recipe(s) from Prathibha's blog and post about it. Stay as true to the original recipe(s) as possible. Therefore, there is no need for re-posting it, simply link to the original post. Multiple entries are welcome! There is no time-frame for the original recipe. It can be as old as your grand-mother or as fresh as a mung bean sprout. Have you cooked from Blog of the month before? As this event is all about tasting and reflecting on the taste, older posts are also welcome. Kindly repost it & give a link to this post. Don't forget to mention about the T&T event. Deadline is 6th May 2011 and the round up will be posted within 15 days. Non-bloggers are more than welcome to participate.Simply e-mail me with your experience of what you cooked and please include a picture. I am clearing my pantry from the last couple of weeks. Even after not buying any grocery for almost a month, I am able to manage run the kitchen for another month! I had a huge packet of self raising flour lying in my store room & hence came up with this recipe. I added instant oats too, to make it a healthier one. Take a broad vessel. Add all the above ingredients mentioned & prepare a smooth batter out of it (Similar to the dosa/pancake batter). Ensure there are no lumps. Keep the batter aside for 5 mins. Meantime heat a griddle/tava/tawa. When the griddle is hot, pour around 1.5 tbsp of batter in the center of the griddle & spread it gently. Add few drops of oil & cover the griddle. Cook both sides of the pancake on a medium high heat until golden brown. Remove the pancake & repeat the procedure with the remaining batter. Enjoy it hot with a spicy dip of your choice. If you do not have self raising flour, then use All-Purpose flour/maida. Add 1/4 tsp of baking soda to the batter to make the pancakes light & fluffy. You could add any vegetables of your choice. I added variety of vegetables I have in my refrigerator.